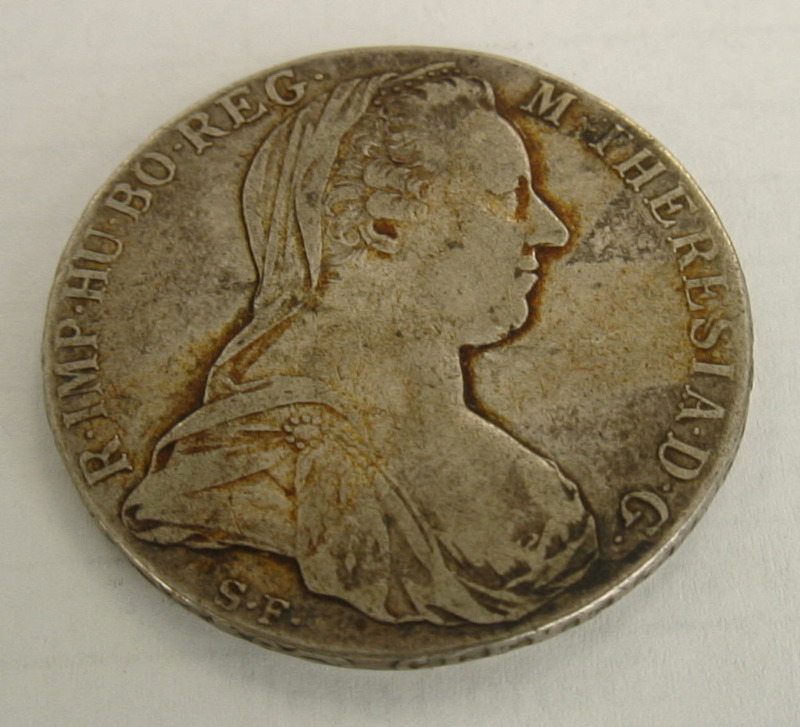 Maria Theresa Thaler silver coins are 83.3 percent pure silver coins with a total mass of 28.06 grams. So the fine silver content of a Thaler silver coin is 23.39 grams. Its diameter is 39.5 to 41 mm and is 2.5mm thick. The reverse presents the double headed eagle coat of arms of the house of Hapsburg, to which Empress Maria Theresa belonged. Maria Theresa Thaler Silver coins off of the above mentioned weights or dimensions have ether being worn out excessively, or material has been removed from them purposefully. 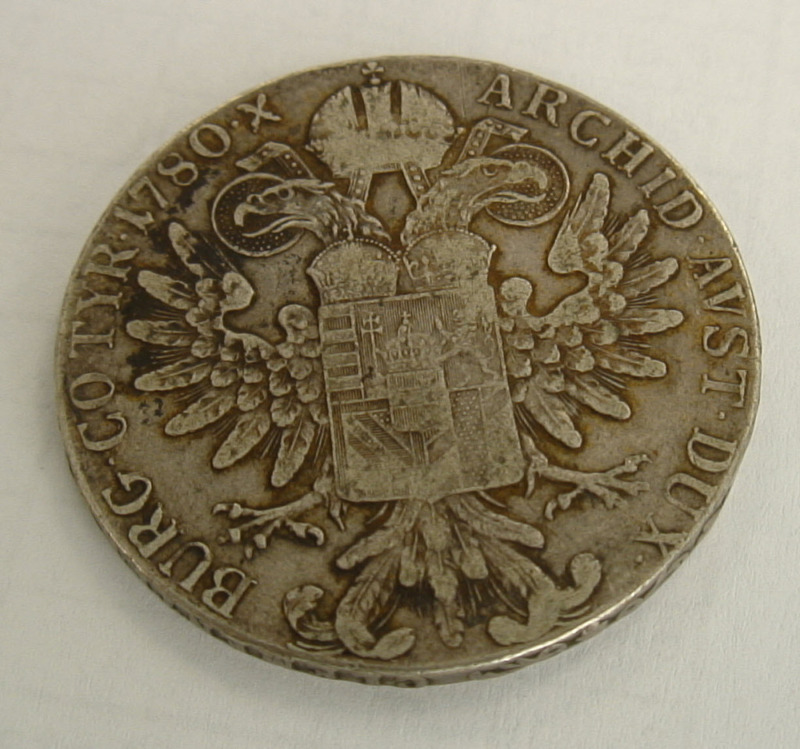 Between the year 1751 and 2000, some 389 million almost identical Maria Theresal Thaler Silver coins have been minted. Given how many of this coins exist, the numismatic value of Maria Theresa Thaler silver coins is minimal. For the most part, at least in the United States, these silver coins retail and liquidate for about the as Morgan and Peace dollars. Very few of Maria Theresa Thalers go for more. Another issue, is that they were minted in lots of countries. This is not bad, but just adds confusion when it comes to numismatic value. The intrinsic value of Maria Theresa Thaler silver coins is based on the actual silver content and the price of silver at that particular moment. Thus, as bullion, expect some discount with respect to spot market when selling silver dollars. Very few Maria Theresa Thaler silver coins will fetch much more than spot market when sold to a precious metals dealer. Maria Theresa (1717 – 1780P was a Hapsburg Holy Roman empress. To say the least, she was a powerful woman. One of her daughters was Marie Antoinett, the last, and decapitated queen of France. Part of her territory was what now is the Czech republic. During her reign, they found in the valleys great silver deposits. It is out of the silver in this deposits that the Thaler coins were initially minted. In the local language at that time, the word “thaler” meant valley. Eventually the coins became universally accepted in trade all the way to the 1960’s. Thalers are very important in world monetary history. The word “thaler” soon became transliterated in multiple languages. The English transliteration of “thaler” is “dollar”. Thus the word “dollar” is a derivative of the word “thaler”. The US silver dollar is highly related to the silver thaler. They are very close in mass and in fine silver content.